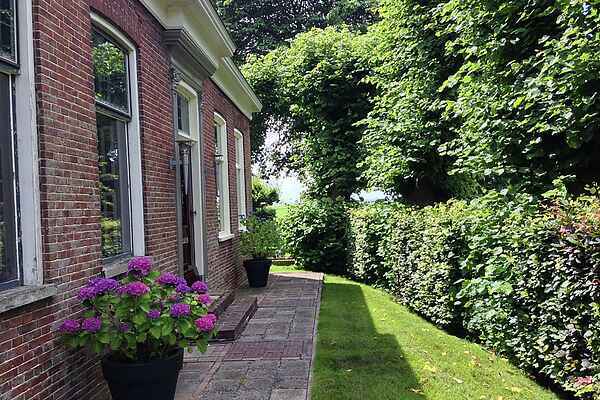 This apartment with a great ambience is ideal for exploring all the nice things that the province of Groningen has to offer. It is one of the two apartments situated on the first floor. There is a lockable storage area where you can store bicycles, as well as a dock for a boat. There is also a good bus connection. The apartment is located in the village of Ten Post on the bank of the Damsterdiep, a historic waterway located between Groningen and Appingedam (12 km). There are also bicycle routes nearby for exploring the Groningen 'uplands'. This area is known for its centuries-old churches and castles. The city of Groningen, with its Groninger Museum, comic strip museum, Martini Tower and shops, is definitely worth a visit. Pieterburen and the harbour town of Delfzijl are just a short drive away. From here you can also easily take a daytrip to the Wadden Islands of Schiermonnikoog or Borkum. After all this activity, it's nice to spend a relaxing evening in the little garden or in the apartment, watching a film or programme on Netflix, HBO or Film1.